A perfect prosthetic option for anterior cases when esthetic concerns aren’t a factor in material choices, our noble and high-noble full cast crowns and bridges are the most biocompatible solution available. The strength of cast metal ensures they’re durable enough for a lifetime of use, while being the most forgiving restoration on opposing dentition available. Inlays and onlays can also be fabricated as a full-cast restoration. Feather-edge margin preparations are indicated for full-cast restorations, but any margin preparation may be used. 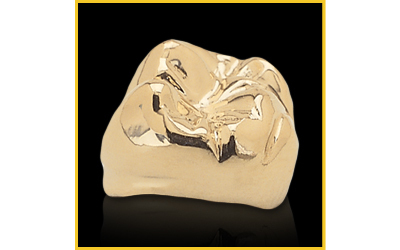 All castings are made with a metal alloy, be it non-precious, semi-precious or precious metals. Alloys are classified by their content. Alloy type refers to the hardness and/or softness of the material. Non-Precious, Noble 20, White High Noble – Type IV – Very hard and rigid. These crowns are more difficult to adjust and re-polish than alloys with a high gold content. Full Cast 40 – Type III – Yellow high noble alloy. Brand name currently used is Argenco 40 HN. Full Cast 52 HN – Type III – Yellow high noble alloy. Brand name currently used is Argenco 52. Full Cast 75- Type III – Yellow high noble and is an upgrade from full cast 52. The gold is slightly more yellow in color. Brand name currently used Argenco 75. As the oldest dental lab in Southern California, we’ve had more than 70 years to perfect our processes and innovate as restorative dentistry evolves. Our perspective combines the most rigorous quality control procedures in the industry to provide the finest veneers, bridges, implants, partial dentures and attachments to dentists in the Orange County and South Hollywood areas as well as practices throughout the country.